For many years scholars have sought to explain why the European states that emerged in the period before the French Revolution developed along such different lines. Why did some states become absolutist and others constitutionalist? What enabled some to develop bureaucratic administrative systems, while others remained dependent upon patrimonial practices? 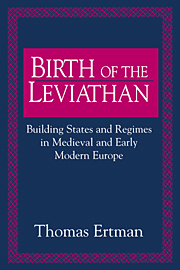 This book presents a new theory of state-building in medieval and early modern Europe. Ertman argues that two factors--local government and sustained geo-military competition--can explain most of the variation found across the continent. 1. Introduction; 2. The origins of patrimonial absolutism in Latin Europe; 3. The triumph of patrimonial absolutism and the failure of reform in Latin Europe, c. 1500–1789; 4. Bureaucratic constitutionalism in Britain; 5. Bureaucratic absolutism in Germany; 6. Patrimonial constitutionalism in Hungary and Poland and its premature demise in Scandinavia; 7. Conclusion.